Nicholas Ball grew up in Chattanooga, TN. He received his B.A. in Chemistry at Macalester College where he conducted undergraduate research in the lab of Professor Ronald G. Brisbois focusing on a modified Songashira reaction generating bisarylethynes. After Macalester, he joined the laboratory of Professor Melanie S. Sanford at the University of Michigan – Ann Arbor. In the Sanford Lab he studied the structure and reactivity of Pd–fluoride and trifluoride complexes toward the formation of organofluorine compounds. After completing his Ph.D. in 2010, he headed to the California Institute of Technology to pursue his postdoctoral studies with Professor David A. Tirrell as a NIH Postdoctoral Fellow. In the Tirrell laboratory, he transitioned into chemical biology studying the role of selenium-based amino acids for the identification of low-abundant proteins. Nicholas started as an Assistant Professor at Amherst College in 2013. 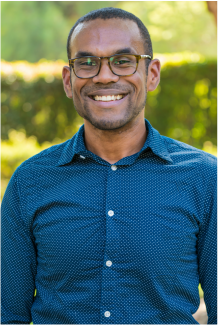 In 2015 he joined the faculty at Pomona College as an Assistant Professor of Chemistry. NDB photo is by Jeffrey Hing.